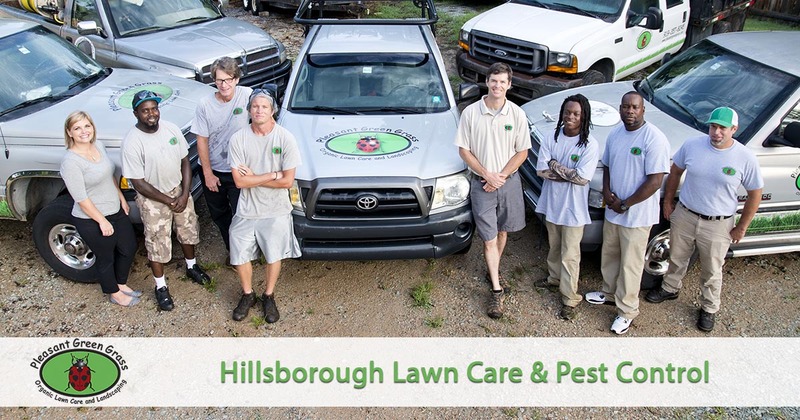 If you are looking for effective lawn care and pest control services in the Hillsborough, NC area that are safe for your family and pets, then look no further. Pleasant Green Grass offers organic lawn fertilization and pest control services that are safe for your family and pets. Hillsborough, NC, has long been celebrated for its rich history and thriving arts center. But keeping our community looking great is hard work! You may discover that it is quite difficult to find a lawn care provider who offers the services your yard needs at prices you can afford. But many cheap service options only rely on harsh landscaping chemicals and products. Instead, Pleasant Green Grass achieves the level of care you deserve with only natural service applications. We have organic solutions for your yard no matter your concern! Call today for the natural choice in complete lawn care services. We guarantee better results without the yard poisons! Whether you need a better choice in monthly yard maintenance or you just need to know you aren’t making your plants sick, our team is here for you. We care for your plants using only organic methods that achieve better growing. From regular lawn fertilization and weed control, to complete yard renovations, our team does it all. Call us for all your landscaping needs and save! Of course, grass and soil concerns are only part of caring for your yard. One of the top issues facing more homeowners is taking care of lawn pests. The easy solution is fogging your entire yard with toxic fumes. But the simple way isn’t always best! Instead, we offer natural pest control solutions for more common pests. Whether you have mosquitos and fleas, ticks and spiders, grubs, or even spiders, we have an organic application for you! Call now to get rid of all your pests without harming your yard. We guarantee safer pest protection! For the best in natural yard care, you can rely on us. Call now for your best services! The organic lawn fertilization and pest control services we offer in Hillsborough, NC are healthier, safer, and more effective than traditional chemical applications that are harmful to people, pets and the environment. Give us a call today and experience the difference in working with a company that cares as much about the safety of the products we use as we do for our customers.